What can I watch with a subscription to Rogers NHL LIVE™? 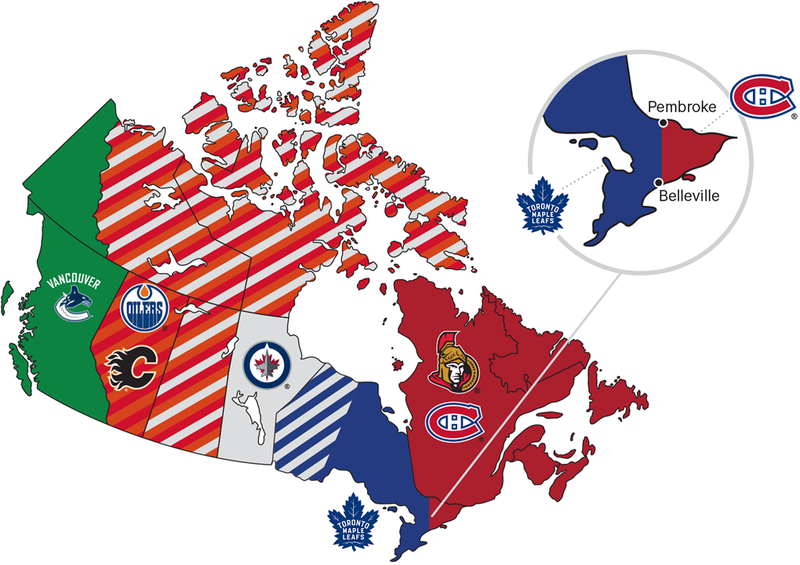 This map is a depiction of the broadcast territories for all seven Canadian teams. As you can see, it is a complicated illustration that can lead to many questions, which is why we are attempting to provide all the necessary answers to questions that you—the customer—may have. To see which games you get included in your subscription, we have included a number of tools here for your convenience. If you would like to check the NHL schedule on a daily basis to see what games you’re able to watch, proceed to our handy What Can I Watch? tool. Simply choose your province and team–or, if you wish, don’t choose a specific team and you can see games of all teams–you wish to watch and click ‘Check.’ If you are from Ontario, you will also have to input your postal code. This is because Ontario is designated with more broadcast regions than other provinces, resulting in a number of cases where someone is on the boundary between two regions. Once you have selected your province and team, you will be given the day’s schedule. If a game is grayed out, it means the game is a blackout in your region. Anything that is red is available for you to watch with your subscription. Note: Blackout/authentication rules are applied based on where you are accessing the game from, not based on billing address. If you would like to see approximately how many games you will get in your subscription based on your location, proceed to any of the regions below. How many NHL games are broadcasted in Canada on TV? What is the difference between Out-of-Market and In-Market NHL games? Blackouts only apply to in-market NHL games. National games and out-of-market games are not subject to blackouts. When a fan is trying to watch an in-market game they will only be able to access that game on television from the local broadcast partner that owns the TV rights. Within Rogers NHL LIVE™ that game will be blacked out. When the right to an in-market game is owned by Rogers it is broadcasted on TV on Sportsnet. When the right to an in-market game is owned by TSN, RDS, or TVA, the games are broadcasted on those TV channels. We have included all these in-market games in Rogers NHL LIVE™, but they are subject to TV authentication. TV authentication means that if a subscriber is trying to watch an in-market game on Rogers NHL LIVE™, they must also have the corresponding TV channel for that game within their cable TV package with a participating TV provider. If the subscriber does not have the corresponding channel within their TV package, that game will not be available within Rogers NHL LIVE™ (it will be blacked out). If the subscriber has the channel within their TV package, but the TV package is not from a participating TV provider, that game will not be available within Rogers NHL LIVE™ (it will be blacked out). If the subscriber has the channel within their TV package and the TV package is from a participating TV provider, that game will be available within Rogers NHL LIVE™ (the stream will start). What does all of this mean for a subscriber to Rogers NHL LIVE™? I subscribe to Sportsnet, TSN, RDS, and/or TVA Sports through my TV provider – why can’t I watch my local team’s regional games within Rogers NHL LIVE™? We provide the opportunity to all television distribution partners to allow their customers to connect their TV subscription to Rogers NHL LIVE™ in order to have a single, easy access-point to all the games they have paid for through both Rogers NHL LIVE™ and their TV subscription. However, it is the choice of each provider whether or not to participate. We are eager to add all providers and there is no cost for them to do so. Please contact your provider and let them know you want to be able to connect your subscription to Rogers NHL LIVE™. My TV subscription is with a participating TV provider, and I have connected it to Rogers NHL LIVE™, but I am still unable to access certain games. Why?